Results were revealed this week of the fiercely contested 12 hole winter eclectic. We were fortunate to be able to play all 7 scheduled rounds. 49 ladies took part playing over 230 rounds. Well done to all who competed. Division 1 winner was Sarah Faircliff on countback from Sally Weekes. Both scoring a magnificent 48. Division 2 winner, Nicola Adkins by one shot from Helen Leigh, scoring 52. Great winter golf aided by Chesfield Downs wonderful greens. The presentation took place after our first social light lunch of the year in a sun filled conservatory. Angela Hamilton and Pat Ward enjoyed the weather and the company on Monday at Mount Pleasant but unfortunately lost their match 3&2. Sign up sheets are on the board. Closing date Tuesday 21st. A draw will take place on 23rd March after golf in the conservatory. Seven ladies played in the individual stableford, forming part of the Ken Bird Winter League. Pat Ward being the highest scoring lady with 37 points. This puts Pat 2 points ahead of Linda Brown in the Order of Merit. Four rounds to go. 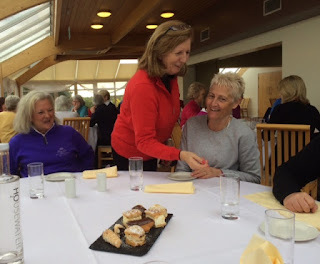 A gift, a wish, a joker over 18 holes - Winner on countback Katy Cook from Margaret Gentle both scoring 45 points, so they must have chosen wisely. With storm Doris paying us a visit 30 hardy ladies wrapped up and ventured out on to the par 3 Lannocks Links. Although the sun was shining the Megan Bonner Par 3 Championship was reduced to 9 holes - that was enough. Hats blew, bags blew and cobwebs were well and truly blown away. Who won???? The winner will be announced at the Spring Meeting on 11th May. Thursday sees a full field competing for the first trophy of the season The Price Vase. Good luck ladies. Click here to read a handy guide on how to properly repair pitchmarks. As it says in the article it's "worth reading as a poorly repaired pitchmark takes twice as long to heal! ".